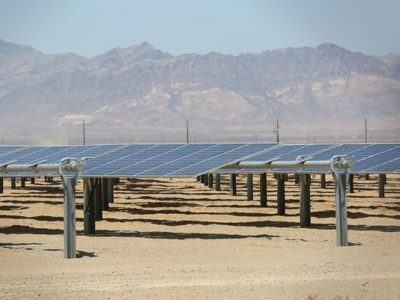 California is shattering solar records. This bill could take renewable energy to the next level. Introduced by Assembly member Kevin Mullin, D-San Mateo, the bill would create a “clean peak energy standard” for California utilities. By 2029, utilities like Southern California Edison, PG&E and SDG&E would be required to get 40 percent of their energy from clean sources during “peak demand” periods — the handful of hours each day when homes and businesses use the most energy — on at least 15 days each month. That requirement would encourage the development of battery storage systems, which could soak up excess solar generation during the middle of the day and release that energy onto the grid after sundown, reducing the need for gas plants. The bill could also speed the adoption of energy efficiency and conservation programs that reduce electricity use during peak periods. Click here to read more. Photo by Jay Calderon, The Desert Sun: NextEra’s 250-megawatt McCoy solar project, just west of Blythe, California. Solar garden continues to grow, The Courier. The Cedar Falls Utilities solar garden, Iowa’s largest community solar project, is marking its year anniversary of increasing renewable energy for the city. Minnesota Museum, University Sign Up For Community Solar, Solar Industry Magazine. Minnesota-based renewables developer Geronimo Energy LLC says it has secured several major subscribers for its Nordic Solar Portfolio, which includes over 30 community solar gardens spread across 18 Minnesota counties. Publicly announced subscribers include the University of Minnesota (U of MN), the Science Museum of Minnesota and Hennepin County. Innovative Aggregation Expands Access to Large-scale Renewables, Renewable Energy World. The development of the 60-MW Summit Farms Solar project was driven by demand from the Massachusetts Institute of Technology (MIT), Boston Medical Center, and Post Office Square Redevelopment Corporation . . . This aggregated approach to purchasing renewables demonstrates that a broad range of organizations can capture economies of scale typically reserved for utilities, or the likes of Google or Amazon. This entry was posted in NewsBlog and tagged "clean peak energy standard, energy storage, renewable energy legislation, renewable energy's economic benefits, renewable energy's reduced costs, U.S. renewable energy development on March 27, 2017 by Helen Deffenbacher.